> Balihoo > Use the Local Web to Increase Number of Customers! Local marketing - i.e. communication a potential customer receives when they are at their closest point to making an actual purchase decision - is highly relevant to converting consumers with purchase intent into buyers of a brand's products. However, most national brands who sell through local outlets don't fully capitalize on local marketing. 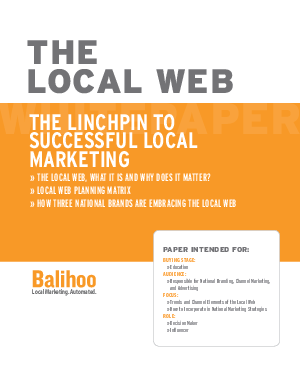 This guide, specifically tailored for national brands, explores the current rise of local marketing, how the "Local Web" makes it easy to reach consumers, and steps your brand can take to optimize your marketing strategy with local marketing.